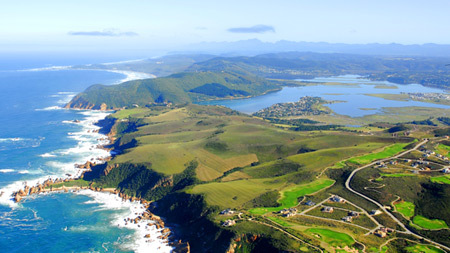 Demand for property in Simola Estate in Knysna, has seen prices rising rapidly on this eco-estate. Whether you have your eyes set on the sought after Simola Golf and Country Estate because you’d like to purchase a lavish home or because you want to obtain a stand to build your dream home on, you’d better jump fast to secure an address in this enviable estate in Knysna. Jacqueline Kvalsvig, an estate agent with Seeff who sells in Simola, says that fewer stands have sold in the estate recently than in previous years, mainly due to limited stock availability. “Most of the cream of the crop plots offering the best views has already been snatched up by astute buyers, but there is still a fine selection of plots with remarkable views that have come onto the market recently. While the average price of a plot sold in 2015 was R750 000, the average price of the plots sold to date this year is R1.775 million. Average prices and sizes of vacant plots range from R1 million for 1200m2 to R4 million for 10 000m2. Prices depend on location and views. Likewise, the average price of a home sold in the estate was R5.7 million in 2013, but it is predicted to increase to the R6.5 million mark this year. All the homes sold in the past year have been in excess of R6.2 million and up to R7.5 million”. Kvalsvig continues that homes in Simola are priced between R3,9 million and R30 million and that the overwhelming majority of buyers are aged between 36 and 64 years. “Entry level spacious single storey homes at 250m2 on a 1200m2 plot can be scooped up at R3.9million including transfer duty and typically includes three bedrooms, two bathrooms, a double-garage, pool and covered outdoor entertainment area with built-in-braai. Ultra-modern contemporary homes from R7million upwards to R30million incorporate all the elements of nature with the beauty of natural stone, marble or granite. Floor to ceiling glass create transparent walls to capture sunlight and views of the majestic Knysna Heads, river and/or lagoon. These homes also include features such as fully equipped gyms, wine-cellars, surround sound, rim-flow pools and Jacuzzis, underfloor heating, air-con and state of the art built-in appliances amongst others. Five and six bedroom house sizes range from 500m2 to 1300m2 on erf sizes of 1100m2 to 10 000m2. “Most people who invest in Simola are buying either a second holiday home or are retiring to Knysna and we also see many foreigners investing here because of the value for money they receive in terms of the calibre house and quality of living. There has been a decrease in loans registered over properties in Simola which indicates that most sales have typically been cash buyers who are well established in a mature market”. Kvalsvig adds that Simola, referred to by many as the jewel in the Crown of Knysna, is primarily a large Eco country estate with a five star hotel and luxury spa surrounded by an electric fence and 24-hr security-manned controlled access. The estate also boasts a large variety of bird and animal wildlife running freely through the forested areas. The Jack Nicklaus course is considered by golfers from near and far as one of the best courses in South Africa, if not the world”, concludes Kvalsvig. Nestled between the Knysna estuary, the Indian Ocean and a vast indigenous forest, this town is full of natural beauty. With three magnificent golf courses, it is a haven for golfers. The waterfront is a popular tourist destination for great food and shopping. Known for its oysters, this town has festivals and events for all kinds of interests. An ideal holiday destination or retirement place, experience tranquility and a safe, small-town life.